Contemorary R&B act 'Championz' have signed with Quetone Music! This supergroup of incredible R&B artists is made up of Wilbz, Don P and Quetone Music CEO, Quion. 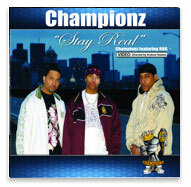 After bursting onto the Boston music scene like nothing that's ever been seen before, Champions ran into strife when two of the original artists Quion worked with were murdered and another went to jail. But he did not give up and now the line-up is stronger than ever. Championz have been performing regularly around Boston, but have just announced their 'Take Over Tour' when they are going to take over the hearts and minds of everyone watching! Stay tuned for more details on the tour. To find out more about Championz go HERE!